Just as with the operational plan, the management plan can be organized into sections. These sections may include ownership, internal management, external management resources, and human resources. If your business is a one person operation, you won’t need to have all of the various sections. The deciding factor will be you, after you have had a chance to evaluate your business and know the general direction it is going, and who will actually be in charge of running it. If you have a sales force, as well as marketing people, you probably have a manager over each department. If this is the case, you need to include them in your management plan. You may want to also include each manager’s compensation, benefits, and any other contractual agreements that exist. If you are planning to hire third-party providers or outside firms to help handle certain aspects of your business, the manager of these firms should be included in your plan as well. How to Handle the Financial ComponentsThe financial component of your business plan has three main objectives: 1. Identify where the company is financially.2. To determine how the company performed during the previous year.3. To provide an analysis of where the company will be in the future.When considering where the company is financially, the company’s total resources and assets need to be looked at so as to know how they are controlled and if any claims are against the business. By looking at the financials, it helps to measure the company’s financial position at any given time, and can help others to decide if the company has the ability to withstand risk and provide a benchmark against which to measure the results of future business decisions. 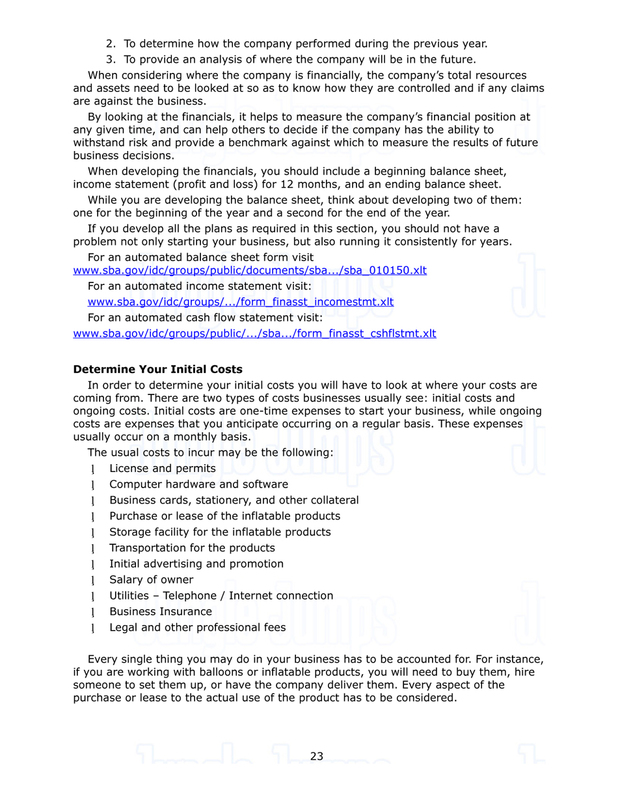 When developing the financials, you should include a beginning balance sheet, income statement (profit and loss) for 12 months, and an ending balance sheet.While you are developing the balance sheet, think about developing two of them: one for the beginning of the year and a second for the end of the year.If you develop all the plans as required in this section, you should not have a problem not only starting your business, but also running it consistently for years. For an automated balance sheet form visit www.sba.gov/idc/groups/public/documents/sba.../sba_010150.xltFor an automated income statement visit:www.sba.gov/idc/groups/.../form_finasst_incomestmt.xltFor an automated cash flow statement visit:www.sba.gov/idc/groups/public/.../sba.../form_finasst_cshflstmt.xltDetermine Your Initial Costs In order to determine your initial costs you will have to look at where your costs are coming from. There are two types of costs businesses usually see: initial costs and ongoing costs. Initial costs are one-time expenses to start your business, while ongoing costs are expenses that you anticipate occurring on a regular basis. These expenses usually occur on a monthly basis.